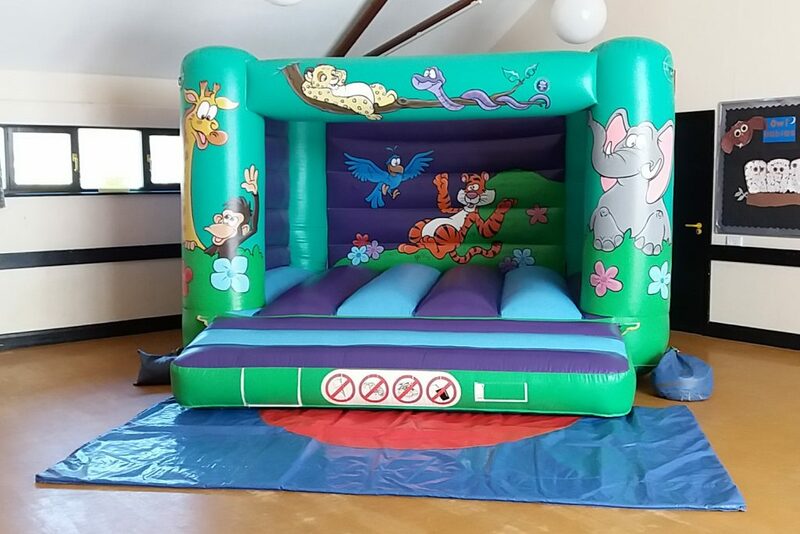 As a reliable family run local business we have been hiring bouncy castles and soft play in the Southampton area for the past 17 years. All our castles have PIPA tests yearly and we have Public Liability Insurance of 5m. 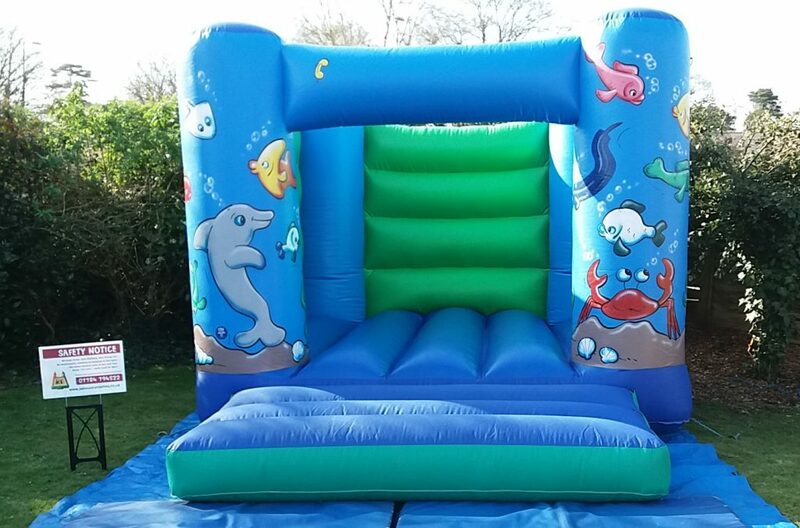 Bouncy castles are available for outdoor hire on grass between April and October. All outside bookings subject to weather. Unfortunately the bouncy castles and soft play are not suitable in conjunction with face painting or Glow parties. This castle is suitable for children up to 12 years old. It has high walls and therefore ideal for primary age children. Ideal for schools and summer fetes. The floor space required is 14′ wide x 20′ plus space for the mat. 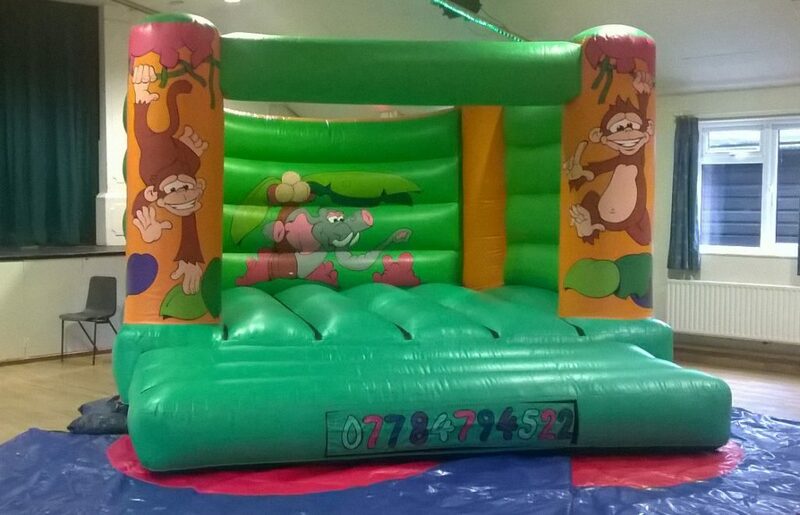 Bouncy castle is 12′ wide and is a bright and colourful jungle design. Height is approximately 8′ and is suitable for all halls. 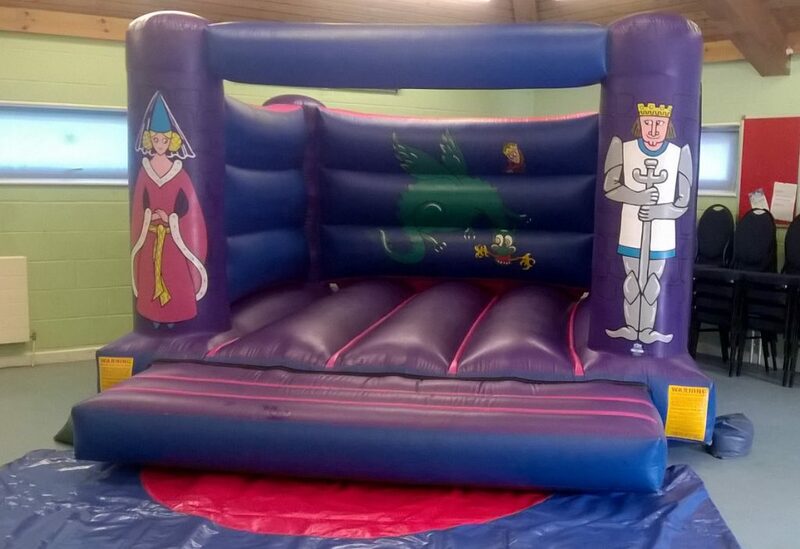 Ideal for boys or girls with a knights and princess design and comic dragon on back wall. The ideal castle for children’s parties where most of the children are 8 or 9 and under (if they can see over the walls they are too large for the castle). More photos of this castle can be seen on the soft play pages as it is very popular for younger parties. Floor space required is 14′ wide x 18′ plus space for the mat. This castle is12′ wide, 8′ high and fits in all halls. Arched castle with built in shower cover, suitable for children under 12 years only. 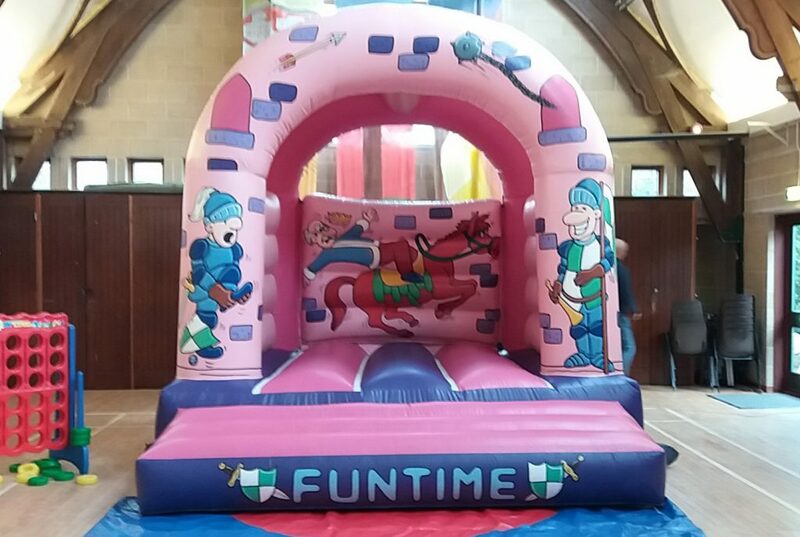 Great for a ‘pink party’ but boys also can’t resist a bounce on this knights/castle themed bouncer. Space needed is 16′ wide x 21′ plus space for the mat. You will need to check hall height as castle is 11’+ high. Ideal for the slightly smaller garden and parties with sealife or pirate theme. High walled castle suitable for preschool and primary children. The ideal castle for children’s parties where most of the children are under 8 years. 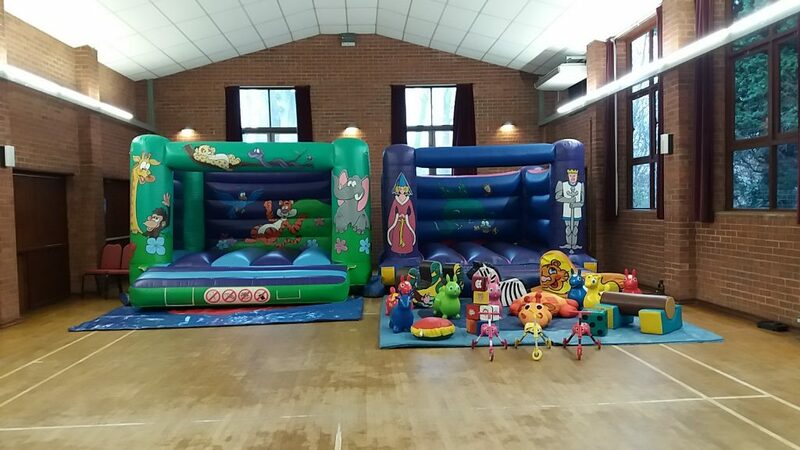 More photos of this castle can be seen on the soft play pages as it is very popular for parties when combined with soft play. This bouncy castle is 11′ wide and 8′ 6″ tall. Floor space required is 13′ wide x 18′ plus space for the mat. Suitable for adults OR children (not at the same time), brightly coloured castle with jungle design which is ideal for any occasion. An impressive high sided castle which is ideally suited for schools, fetes, family parties, etc. The floor space required is 18′ x 24′ plus space for the mat. Castle is 15′ square and is 9′ 6″ high. The following photo shows the size difference between our castles suitable for under 12 years of age. The Jungle castle is recommended for Primary age children.